For starters, we’re moving! After three years in the DC metro area (four for Morgan), we’re picking up and moving back to Charlottesville, the town of our alma mater. This fall I’ll be starting a second-degree nursing program leading to a master’s of science in nursing, moving from the research side of healthcare over to the clinical side. I’m pretty excited about it! Though Chef Edwin and I will no longer be just a stone’s throw away and there might be a week period where my pots and pans are living in boxes instead of having culinary adventures, Charlottesville offers a lot of really cool things. In 2004, Charlottesville was ranked the best place to live in the United States in the book Cities Ranked and Rated by Bert Sperling and Peter Sander, based on cost of living, climate, and quality of life. I see many visits to the farmer’s market in my future. If you’re from the area, please let me know other great things to do, see and eat! In any event, the kitchen isn’t packed up just yet. 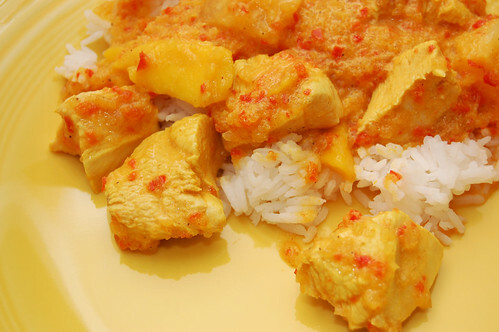 So today I’ll share with you a very tasty pineapple mango chicken curry recipe. I adapted the original recipe for a mango curry chicken from Simply Recipes. I had to figure out a way to keep the mango flavor toned down because I’m not a huge fan of that particular fruit. This dish came out on the sweet side because of the pineapple and little bit of sugar (almost like a sweet and sour chicken, but really not quite). If you’d like to tone down the sweetness, add some vinegar. Neither the pineapple nor the mango are overpowering, though. I added most of the pineapple and almost all of the mango to the food processor instead of leaving more as fruit chunks at the end (since, as I said, I’m not a huge mango fan). You can of course vary this according to your personal tastes. Heat oil in a large sauté pan over medium heat. 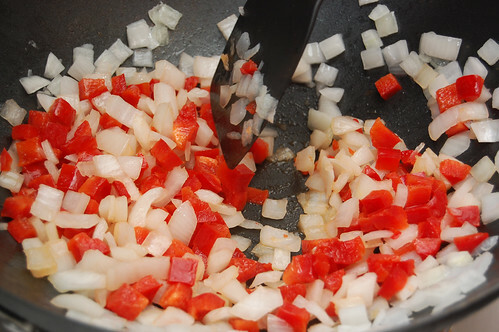 Add onions, stirring occasionally until soft and translucent, about 5-6 minutes, then add red bell pepper. 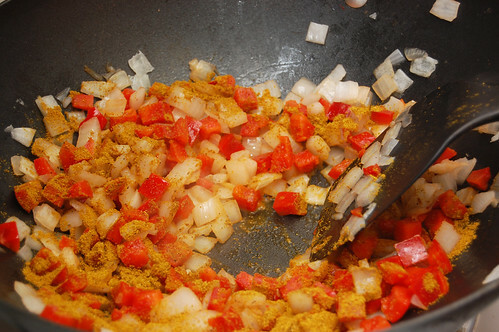 Add the curry powder and cumin, cook for a few more minutes. If spices begin to stick too much to the bottom of the pan, add a little more oil. Add the ginger and garlic, cooking for an additional minute or two. 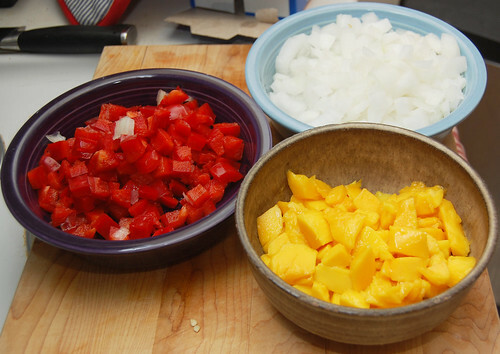 Add vinegar, water, 1/2 to 3/4 of the chopped mango and 1/2 to 3/4 the pineapple to the pan. Bring to a boil, then lower heat to a simmer for about 15 minutes, stirring occasionally. Remove from heat and carefully add to food processor. Pulse until smooth, then return to pan. Add chicken and return to a low simmer. Cover and cook for 8-10 minutes, or until chicken is cooked through. Add remaining mango and pineapple to the pan. Carefully add cream and sugar and cook on low for an additional minute, uncovered. Do not boil! Add salt and pepper to taste and serve over rice. Makes about 3 servings.